This Hymn ( Baglamukhi Hridaya Stotram ) is considered to be heart of the Mother. Hymn’s follower attains whatever he see in this world. Baglamukhi Hridayam Stotram is related to Devi Baglamukhi / Pitambara. Objective of this stotram is to get closer to Mother Baglamukhi. For Baglamukhi Mantra Diksha & Sadhana guidance email to [email protected] or call us on 9410030994, 9540674788. Baglamukhi Vashikaran Mantra is considered as most powerful vashikaran mantra. For mantra diksha & sadhana guidance email to [email protected] or call us on 9410030994, 9540674788. 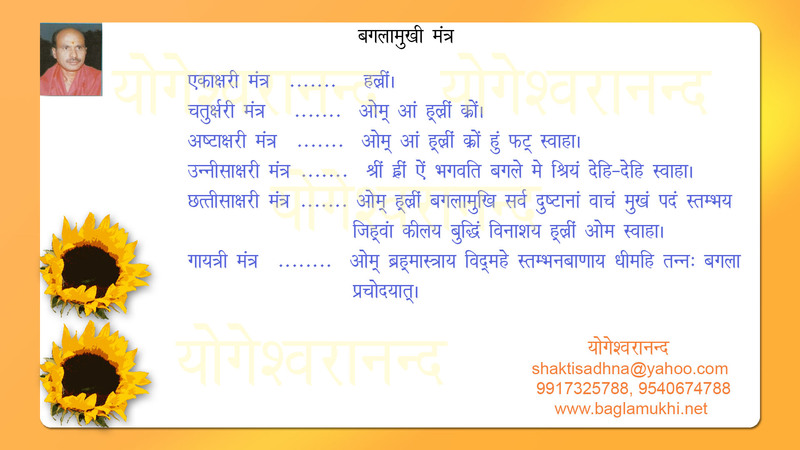 Anusthaan of Baglamukhi Chaturakshara Mantra is done after completing anusthaan of Baglamukhi Beej Mantra “HLREEM”. We have seen that sadhak easily completes baglamukhi beej mantra anusthaan but they face difficulty while doing chaturakshara mantra anusthaan. Here difficulty means that ma baglamukhi takes exam of the sadhak during anusthaan. Sometime Devi baglamukhi will create a situation where you will not be able to do mantra jaap on a particular day. It could be due to your busy schedule or you may have to go out station for some work but remember that ma baglamukhi is taking your exam and you have to pass it to get her blessings. In any situation you have to complete your decided mantra jaap for each day. For example if you have taken sankalpa to do 125000 mantras (1250 Malas) in 21 days then you have to do 60 Malas (Rosary) per day. As per the rule of the anusthaan you can not leave your pooja any single day nor you can decrease the number of Malas (Rosary). Everyday you have to do 60 malas in any situation. So sadhak should complete these mantra jaap everyday. In any case if you are out of station then you should apologize in front ma and you should complete your mantra jaap at that location. Once you complete this anusthaan that no body can stop you to take blessings of ma baglamukhi. Have faith on Ma and continue your pooja everyday, you will definitely get the success. To create happiness in family. To remove graha dosha/ remove malefic effects of plantes. For Astrology, Mantra Diksha & Sadhana Guidance email to [email protected] or call us on 9410030994, 9540674788. Hridaya mantra is said to be the heart of the deity. It is said that a sadhak who chant baglamukhi hridaya mantra gets closer to devi baglamukhi and he get darshan of ma baglamukhi. It is also said that in beginning of baglamukhi sadhana this hridaya mantra should not be chanted as you won’t be able to handle its energy. For Astrology, Mantra Diksha & Sadhana Guidance email to [email protected] or call us on 9410030994 (Sri Yogeshwaranand Ji) and 9540674788 ( Sumit Girdharwal Ji).